I don’t think Al Gore in his wildest dreams could have imagined how successful the “climate crisis” movement would become. It is probably safe to assume that this success is not so much the result of Gore’s charisma as it is humanity’s spiritual need to be involved in something transcendent – like saving the Earth. After all, who wouldn’t want to Save the Earth? I certainly would. If I really believed that manmade global warming was a serious threat to life on Earth, I would be actively campaigning to ‘fix’ the problem. But there are two practical problems with the theory of anthropogenic global warming: (1) global warming is (or at least was) likely to be a mostly natural process; and (2) even if global warming is manmade, it will be immensely difficult to avoid further warming without new energy technologies that do not currently exist. On the first point, since the scientific evidence against global warming being anthropogenic is what most of the rest of this website is about, I won’t repeat it here. But on the second point…what if the alarmists are correct? What if humanity’s burning of fossil fuels really is causing global warming? What is the best path to follow to fix the problem? Cap-and-Trade The most popular solution today is carbon cap-and-trade legislation. The European Union has hands-on experience with cap-and-trade over the last couple of years, and it isn’t pretty. Over there it is called their Emissions Trading Scheme (ETS). Here in the U.S., the House of Representatives last Friday narrowly passed the Waxman-Markey bill. The Senate plans on taking up the bill as early as the fall of 2009. Under cap-and-trade, the government institutes “caps” on how much carbon dioxide can be emitted, and then allows companies to “trade” carbon credits so that the market rewards those companies that find ways to produce less CO2. If a company ends up having more credits than they need, they can then sell those credits to other companies. While it’s advertised as a “market-based” approach to pollution reduction, it really isn’t since the market did not freely choose cap-and-trade…it was imposed upon the market by the government. The ‘free market’ aspect of it just helps to reduce the economic damage done as a result of the government regulations. The Free Market Makes Waxman-Markey Unnecessary There are several serious problems with cap-and-trade. In the big picture, as Europe has found out, it will damage the economy. This is simply because there are as yet no large-scale, practical, and cost-competitive replacements for fossil fuels. As a result, if you punish fossil fuel use with either taxes or by capping how much energy is allowed to be used, you punish the economy. Now, if you are under the illusion that cap-and-trade will result in the development of high-tech replacements for fossil fuels, you do not understand basic economics. No matter how badly you might want it, you can not legislate a time-travel machine into existence. Space-based solar power might sound really cool, but the cost of it would be astronomical (no pun intended), and it could only provide the tiniest fraction of our energy needs. Wind power goes away when the wind stops, and is only practical in windy parts of the country. Land-based solar power goes away when the sun sets, and is only practical in the sunny Southwest U.S. While I personally favor nuclear power, it takes forever to license and build a nuclear power plant, and it would take 1,000 1-gigawatt nuclear power plants to meet electricity demand in the United States. And no one wants any of these facilities near where they live. Fortunately, cap-and-trade legislation is not necessary anyway because incentives already exist – right now — for anyone to come up with alternative technologies for energy generation and energy efficiency. Taxpayers and consumers already pay for billions of dollars in both government research (through taxes) and private research (through the cost of goods and services) to develop new energy technologies. Whoever succeeds in these efforts stands to make a lot of money simply because everything we do requires energy. And I do mean everything…even sitting there and thinking. Using your brain requires energy, which requires food, which requires fossil fuels to grow, distribute, refrigerate and cook that food. Economic Competitiveness in the Global Marketplace Secondly, when instituted unilaterally by a country, cap-and-trade legislation makes that country less competitive in the global economy. Imports and trade deficits increase as prices at home rise, while companies or whole industries close and move abroad to countries where they can be more competitive. The Obama administration and congress are trying to minimize this problem by imposing tariffs on imports, but this then hurts everyone in all of the countries involved. Remember, two countries only willingly engage in trade with each other because it economically benefits both countries by reducing costs, thus raising the standard of living in those countries. The Green Mafia Third, cap-and-trade is a system that is just begging for cheating, bribing, and cooking the books. How will a company’s (or a farm’s) greenhouse gas emissions be gauged, and then monitored over time? A massive new bureaucracy will be required, with a litany of rules and procedures which have limited basis in science and previous experience. And who will decide how many credits will initially be given by the government to each company/farm/industry? Does anyone expect that these decisions will be impartial, without political favoritism shown toward one company over another, or one industry over another? This is one reason why some high-profile corporations are now on the global warming bandwagon. They (or at least a few of their executives) are trying to position themselves more favorably in what they see to be an inevitable energy-rationed economic system. Big Oil and Big Coal Will Not Pay for Cap-and-Trade Fourth, it is the consumer – the citizen – who will pay for all of this, either in the form of higher prices, or reduced availability, or reduced economic growth. Companies have no choice but to pass increased costs on to consumers, and decreased profits to investors. You might think that “Big Business” will finally be paying their “fair share”, but Big Business is what provides jobs. No Big Business, no jobs. The Green Jobs Illusion Fifth, the allure of “green jobs” might be strong, but the economic benefit of those jobs is an illusion. The claim that many thousands of new green jobs will be created under such a system is probably true. But achieving low unemployment through government mandates does not create wealth – it destroys wealth. Let me illustrate. We could have full employment with green jobs today if we wanted to. We could pay each other to dig holes in the ground and then fill the holes up again, day after day, month after month. (Of course, we’ll use shovels rather than backhoes to reduce fossil fuel use.) How’s that for a green jobs program? My point is that it matters a LOT what kinds of jobs are created. Let’s say that today 1,000 jobs are required to create 1 gigawatt of coal-fired electricity. Now, suppose we require that electricity to come from a renewable source instead. If 5,000 jobs are needed to create the same amount of electricity with windmills that 1,000 jobs created with coal, then efficiency and wealth generation will be destroyed. Sure, you can create as many green jobs as you want, but the comparative productivity of those jobs is what really matters. In the end, when the government manipulates the economy in such a fashion, the economy suffers. And even if a market for green equipment (solar panels, windmills, etc.) does develop, there is little doubt that countries like China will be able to manufacture that equipment at lower cost than the United States. Especially considering all of our laws, regulations, limits, and restrictions. So, What’s the Alternative? If anthropogenic global warming does end up being a serious problem, then what can be done to move away from fossil fuels? I would say: Encourage economic growth, and burn fossil fuels like there is no tomorrow! Increased demand will lead to higher prices, and as long as the free market is allowed to work, new energy technologies will be developed. As long a demand exists for energy (and it always will), there will be people who find ways to meet that demand. There is no need for silly awards for best inventions, etc., because the market value of those inventions will far exceed the value of any gimmicky, government-sponsored competitions. Why are Politicians so Enamored by Cap-and-Trade? Given the pain (and public backlash) the EU has experienced from two years’ experience with its Emissions Trading Scheme, why would our politicians ignore that foreign experience, as well as popular sentiment against cap-and-trade here at home, and run full-steam with eyes closed into this regulatory quagmire? The only answer I can come up with is: more money and more power for government. As a former government employee, I am familiar with the mindset. While the goal of a private sector job is to create wealth, the government employee’s main job is to spend as much of that wealth as possible. A government agency’s foremost goal is self preservation, which means perpetuating a public need for the agency. The idea that our government exists to help enable a better life for its citizens might have been true 100 years ago, but today it is hopelessly naïve. All Pain, No Gain And finally, let’s remember what the whole purpose of carbon cap-and-trade is: to reduce future warming of the climate system. 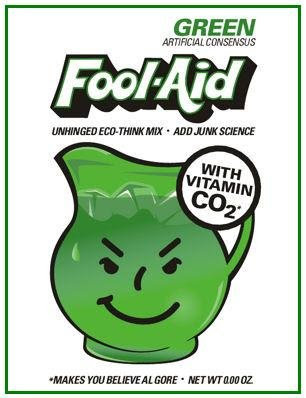 Even some prominent environmentalists are against Waxman-Markey because they do not believe it will substantially reduce carbon dioxide emissions here at home. To the extent that provisions are added to the bill to make it more palatable to politicians from agricultural states or industrial states, it then accomplishes even less of what it is intended to accomplish: reductions in carbon dioxide emissions. And even if cap-and-trade does what is intended, the reduction in CO2 emissions as a fraction of global CO2 emissions will moderate future warming by, at most, around one tenth of a degree C by late in this century. That is probably not even measurable. Of course, this whole discussion assumes that the climate system is very sensitive to our carbon dioxide emissions. But if the research we are doing is correct, then manmade global warming is being overestimated by about a factor of 5, and it is the climate system itself that causes climate change…not humans. If that is the case, then nothing humanity does is going to substantially affect climate one way or the other. Indeed, given the fact that life on Earth depends upon the tiny amount of CO2 in the atmosphere, I continue to predict that more atmospheric CO2 will, in the end, be a good thing for life on Earth. Yet, many politicians are so blinded by the additional political power and tax revenue that will come from a cap-and-trade system that they do not want to hear any good news from the science. For instance, in my most recent congressional testimony, the good news I presented was met with an ad hominem insult from Senator Barbara Boxer. I can only conclude that some politicians actually want global warming to be a serious threat to humanity. I wonder why?